Do you want the sound of a '50s Strat®, but with a little bit more attitude? 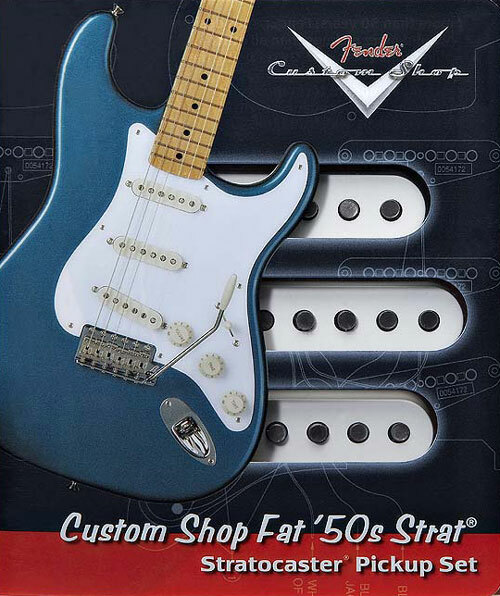 Check out the Custom Shop Fat '50s. These calibrated pickups are constructed with hand beveled, staggered, Alnico 5 magnets and Formvar wire on the coils. The Fat '50s deliver enhanced bass response without the harsh mid-range. The middle pickup is reverse wound/reverse polarity for hum canceling in positions 2 & 4. The blues never sounded so sweet. OEM on the American Standard Strat and the Custom Shop Showmaster Series Strat®. Available in white only. Includes 6 nickel plated Phillips oval head mounting screws, 6 rubber surgical height adjustment tubing, white pickup covers and wiring diagram. Packaging may be visually different as Fender changes graphics on packages from time to time. Bridge Pickup: DC Resistance: 6.2K, Inductance: 2.8 Henries. Middle Pickup: DC Resistance: 6.3K, Inductance: 2.75 Henries. Neck Pickup: DC Resistance: 6.0K, Inductance: 2.4 Henries.